I have this problem where I just can’t seem to stop myself when I’m shopping at Target. I know, it’s a common ailment. But, still, it’s kind of annoying. Especially when I already have a full plate and then an idea hits me. Then not only am I, yet again, spending more money at Target, but I’ve gotta get this idea out before I explode. 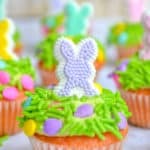 That’s how these easy bunny cupcakes came around. Just a quick peruse down the seasonal aisle. Next thing I knew I had a box of cake mix, sprinkles, and sugar decorations. I think I blacked out. Just like my Easter cookies, these spring treats are perfect for your Easter dessert table. Not only are they super fun, but they’re ridiculously simple to make. 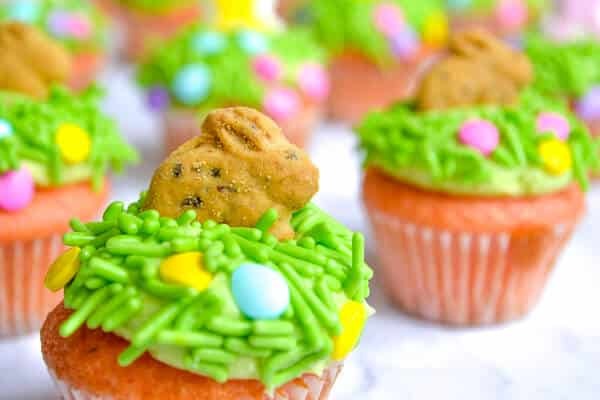 A plop of frosting, a roll in some sprinkles, and a little bunny on top is all it takes to make these unbearably adorable. 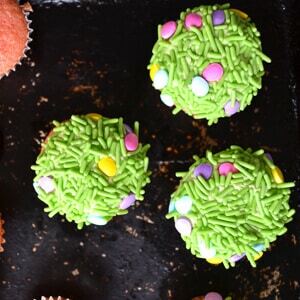 Add your frosting to a bag with a round tip to add frosting to cupcakes without the mess! Mini cupcakes. I used mini cupcakes because I like to limit sugar, but also because one bunny fills the top perfectly. 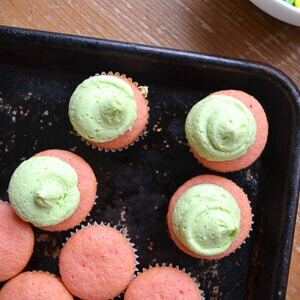 Green frosting. I always make my own frosting because homemade frosting is the best. But canned would be great too. I love the Wilton Gel Colors best. Sprinkles. I bought mine for $3.99 at Target and the tube was enough to cover 24 mini cupcakes. But any green sprinkles would work. Bunnies. I used candy bunnies like these and Annie’s graham cracker bunnies. 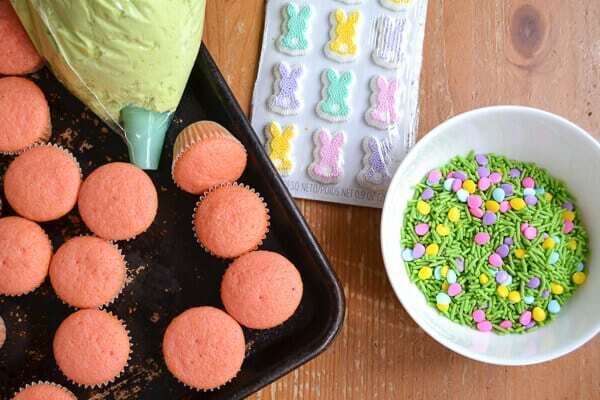 These spring treats are easy and quick to make. Use mini cupcakes to offset all of the candy and treats kiddos tend to get this time of year! I used a round tip to pipe mine out because it’s so much easier. Just add a dollop about 1 tablespoon large of frosting right on top. You could just as easily frost it by hand though. Add your sprinkles into a bowl and dip the top of your cupcake into the bowl. Don’t press too hard and you’ll get pretty, grass like edges. Shake the bowl between each dip to make sure it’s even. Finally, press your bunny into the center of your treat. 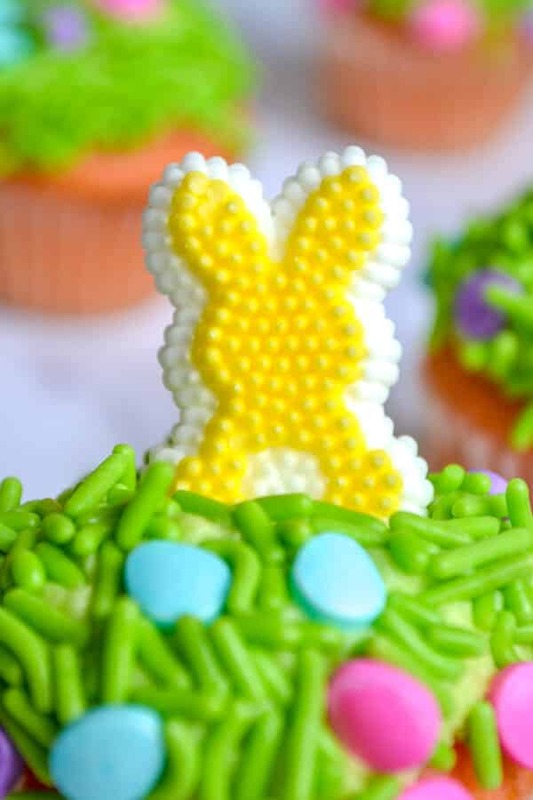 Boom – Easy Easter Cupcakes! This is the perfect dessert to get kids in the kitchen. They can basically do every step! If you want to avoid mess, frost them yourself and assign sprinkle dipping and bunny application to littles. Need more easy tips for getting kids in the kitchen? 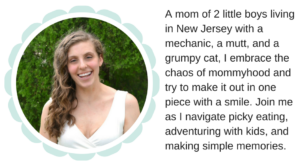 Try my Fearless Kids Cooking Cheat Sheets and Recipes! 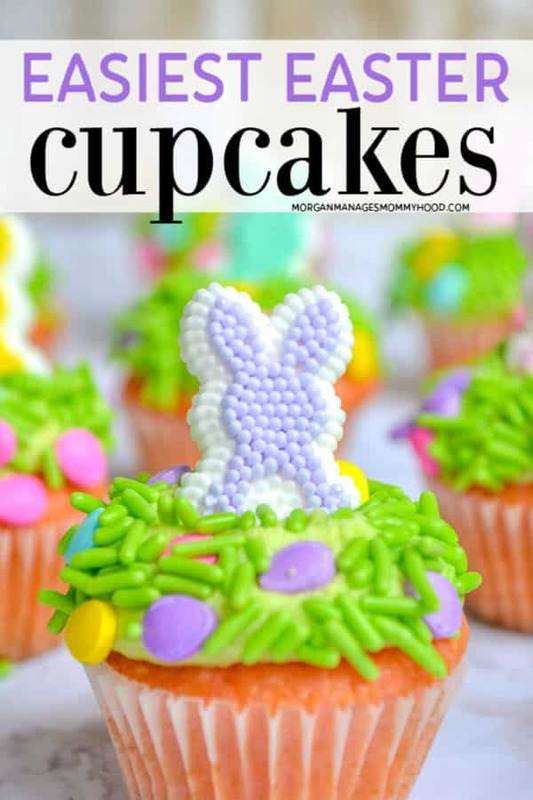 The perfect treat for your Easter brunch spread, these bunny cupcakes take just minutes to assemble and will wow everyone that see them! Add 1 tablespoon of frosting to each cupcake. Dip each frosted cupcake into the sprinkles gently, rotating to make sure all sides are covered. Top with a bunny and enjoy! Okay, so tell me: do you have a problem with the Target holiday aisles? Let me know in the comments! You may also enjoy these fun Easter posts!